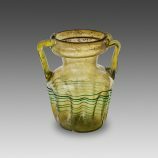 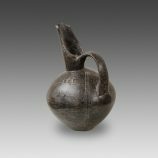 This small, thin-walled amphora was blown in a transparent glass with greenish reflections; the body of the vessel is adorned with a series of bluish concentric threads. 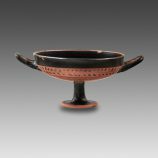 Archaeologists often refer to the term balsarium to designate this class of vessels, which were largely widespread all throughout the Roman Empire. 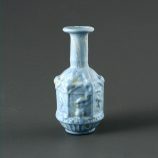 This bottle is modeled in a grayish blue opaque glass with lighter veins. 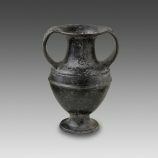 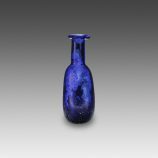 Technically, it belongs to the class of mold blown vessels made in a tripartite mold (the glassmaker would blow the parison directly into a mold composed of three parts, and inflate it to adopt the shape and pattern carved therein). 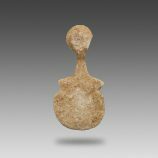 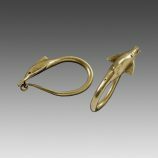 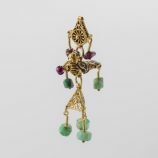 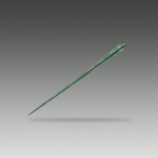 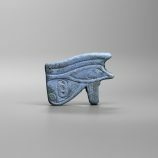 This amulet, molded in a uniform, slightly friable pale blue frit, is carved on both sides and represents a left eye and a right eye in low relief. 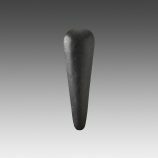 The hole for suspension was pierced horizontally, at the eye level.